West Cumbria Rivers Trust, Bristol Avon Rivers Trust and Westcountry Rivers Trust were among the winners at this year’s Wild Trout Trust Conservation Awards held in London on 17th October 2018. The Wild Trout Trust set up the awards to celebrate the tremendous contributions of individuals and groups improving river habitats. Bristol Avon Rivers Trust won best Medium-Scale Habitat Enhancement Scheme for its Wellow and Cam Initative, in Somerset. The initiative launched in response to a major pollution incident, described as ‘a tsunami of slurry’. It combines technical monitoring with citizen science and ‘early warning’ beacon initiatives, barrier assessment, removal/alteration of six weirs, interactive river sessions for public engagement, ‘yellow fish’ surface drainage protection involving 250 people, formal identification of challenges and opportunities, creation of a dedicated friends-of group, clear future management and much, much. A worthy winner in a highly competitive field. Harriette Alvis, Project Manager at Bristol Avon Rivers Trust, said: “BART are extremely pleased to have been recognised by the Wild Trout Trust for all of the work that we have been doing over the past 5 years on the Wellow and Cam Brooks near Bath. West Cumbria Rivers Trust won best Large-scale Habitat Enhancement Scheme. This ambitious project re-connected the river with Ennerdale Water, delivering benefits for wild fish and freshwater mussels as well as tackling invasive Himalayan balsam and Japanese knotweed. The WCRT and partners overcame significant challenges to remove the mill dam rather than take the easier option of building a fish pass. Removing the impoundment has facilitated both upstream and downstream fish movement and restored a natural sediment transport regime to the river. Luke Bryant, Assistant Director at WCRT, said: “We’re extremely pleased to have won this award. It’s fantastic to be recognised for all of the hard work that we have put into this project, and to raise awareness of how partnership working can achieve massive environmental benefits. 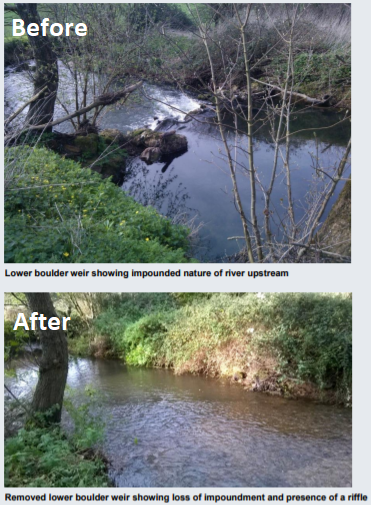 Last but not least, Westcountry Rivers Trust won the Judge’s Commendation for their FishPass App which is a new innovative app set up to support, monitor and adapt the programme of habitat works carried out on the Westcountry Passport streams. The development and initial launch of this app is already achieving valuable ‘wins’ for conservation. Citizen science and engagement are embedded within the day-to-day use of this platform and the strategic (ongoing) development and method selection provide an interesting perspective and possible inspiration for how in-channel restoration schemes can be designed. Wild fish populations are at the core of the angling amenity which drives the many initiatives of the Westcountry Rivers Trust.